zero upfront. no contracts. post-paid. Q. I see your per sms blasting rates. Are there other charges? What are the payment terms? A. No setup fees and no any other fees except per sms charges. No need to sign contracts. We send out invoices to you at the end of the month according to the number of sms sent. No payment/invoice required if no sms is sent on a particular month. Q. I am interested in your "sender-id 2". Why is it cancelled? A. We stopped offering this service in July 2012. Reason:- The delivery rates are becoming un-reliable (~70%) due to new blocking measures from one of Singapore's Telco in June 2012. "Sender-id 2" successful delivery reports were questionable since then. Some sms providers are still offering this service. It is a good deal if delivery rates are not important. Q. I am low volumn sender, about 1000 sms per quarter. At $0.049 per sms, am I really paying only $49? How did you guys survive? A. Yes, only $49. Our intention was to sell our services in bulk; you can see that we do not profit much from each customer. It was not easy when we first started in 2003. 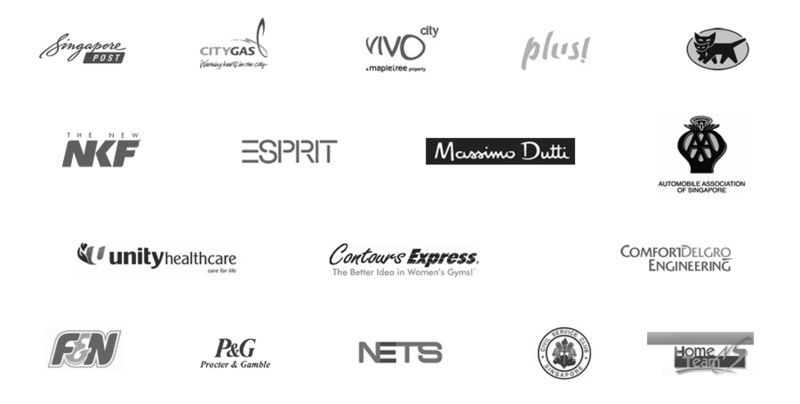 Today we are serving more than 200 active customers + many not very active ones. As of January 2010, our average sms per month is ~ 5 million. Q. 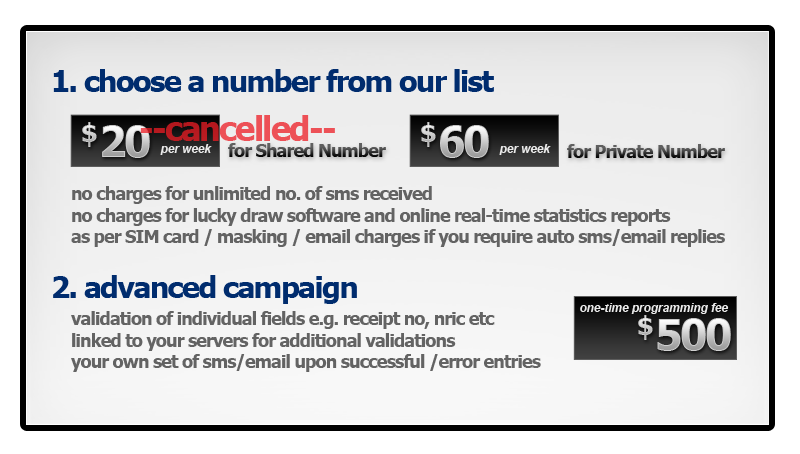 For lucky draw, why will anyone choose the $60 per week rather than the $20 per week for shared number? For shared number, you need to have a prefix in sms entry. Entries without prefixes or mistyped prefixes will be lost. Q. I see that you charge 1 cent per email, do you do email broadcast? The same replyx sms blasting features are duplicated for edm so you can have sms marketing & edm broadcast in one system. In addition, we added tracking for email delivery | hard bounce | soft bounce | opens | clicks | unsub. We will also check for spam traps & frequent complainers before activating your email broadcast. The key component of edm is to acheive highest delivery of emails to the inbox. Our email servers uses full set of authentication methods available in the market; SPF | Sender-ID | Domain Keys | DKIM | Reverse DNS | Fixed IP Servers. Click here to view our email servers sender score. Sender score, provided by senderscore.org, is a comprehensive reputation database covering email senders worldwide. Scores range from 0 to 100. Our server scores are mostly at the 90s.